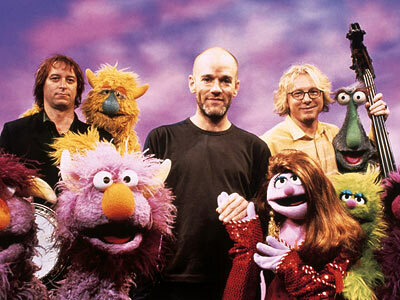 It’s fairly well known that Michael Stipe comes from a long line of Methodist ministers. It’s less well known that he was brought up in the church, by parents he admires greatly, going so far as to describe them as “the paragon of Christian faith.” Of course, this is also the guy who wrote “Losing My Religion,” a song that, much like Bruce Springsteen’s “Born in the USA,” became an anthem for something that it wasn’t about. Stipe has gone on record to say that he was using the phrase “losing my religion” to describe a romantic crisis, not a spiritual one – but, hey, one can certainly understand why non-believers would want to claim ownership of such a catchy tune. He has, after all, made no secret of his ambivalence about much of what passes for Christianity in this country (he produced the movie Saved after all). Still, the fact that he grew up in a sincere expression of American Protestantism and has something other than complete disdain for it, makes his perspective highly a valuable one, even if it weren’t so charismatically articulated. Like his lyrics, Stipe’s convictions are not cut-and-dry, thank God; his records cannot be boiled down to “messages” with which one can agree/disagree. In fact, his conflictedness and enigmatism are a big part of his appeal. He may have helped pen the single most compassionate song of the past 30 years – “Everybody Hurts” will outlive us all – but the directness was the exception, not the rule for REM (and man did it pay off!). and I’m quoting them today. REM announced their break-up last week, and the response has been a tad curious, in that there seems to be almost no objection to it. Or, at least, there appears to be widespread agreement that the time had come. Some predictably superb eulogies have sprung up – no one would ever accuse their fanbase of a lack of fondness for the liberal arts (I particularly enjoyed the tributes on Slate and forum on The A/V Club). Being one of those rare birds who has genuinely enjoyed the messiness of their post-Berry work, I confess to feeling a bit of sadness about the split. Sure, as Stipe’s lyrics and delivery have become more straightforward, the political overtones have become a tad heavy-handed (and quickly-dated), but The Beach Boys pastiches (“At My Most Beautiful,” “Beachball”) have been worth their weight in surfboards, and a handful of the latter-day singles are truly perfect examples of the art (“Imitation of Life,” “Leaving New York,” “Daysleeper,” “Mine Smell Like Honey”). Plus, the spiritual threads have only gotten more pronounced (“Make it All Okay,” “Walk Unafraid,” and my personal favorite, “The Great Beyond”). It’s not all good, of course – some of it is unbearably self-serious – but while the later stuff may not carry the same emotional identification for people as their IRS output, the highlights will make for just as good a compilation one day, mark my words.